This recipe was originally published on November 15, 2014 and republished on December 24, 2017 with updated content and pictures. Panettone can be a little challenging to make at home, but somehow I managed to get great results for Zia Michelinas Panettone on my first try! And if I can do it, so can you! It is absolutely possible to make a panettone at home with the right equipment. One such item is the special paper baking mold with the special print. As the dough expands, it clings to the sides and creates a snug fit. There are also special panettone pans that can be purchased. They are usually tall and tubular in shape. That is what gives the panettone their distinguishable appearance. I read somewhere that you can also use a coffee tin as a replacement for the panettone pan. It also helps if you have a great recipe. Naturally, every one has their definition of what makes a recipe great. I especially love this recipe because it is so light and airy, unlike the store bought versions which can sometimes be very dense. Did you know leftover homemade panettone make the best bread pudding or even french toast? There’s another reason to love this recipe! Hopefully by now, I have peaked your curiosity about this Italian Christmas bread. Are you ready to begin? Here we go! Just like most bread recipes, Zia Michelinas Panettone begins with proofing some yeast. While the yeast is doing its thing, the room temperature eggs can be whisked and the rest of the ingredients can slowly be integrated. Once the yeast is ready, it is just a matter of combining it with the ingredients in your stand mixture. At this point, I switch to the dough hook, add the flour and let my stand mixture do the work for about 8-10 minutes. You will quickly notice that this is a very soft and sticky dough. Please note that all of the ingredients should be at room temperature. At this point, the dough needs to rest for a good couple of hours. So transfer the dough in a really big bowl; cover with plastic wrap; place a tea towel over the whole thing and wait until the dough has doubled or even tripled before proceeding. When the dough is ready, punch it down. Carefully separate in thirds and place into the 6 inch molds. Each mold should have about 550 grams of dough. If you do not have a scale, don’t worry. Try to distribute as evenly as possible. At this point, the dough needs to rise again. 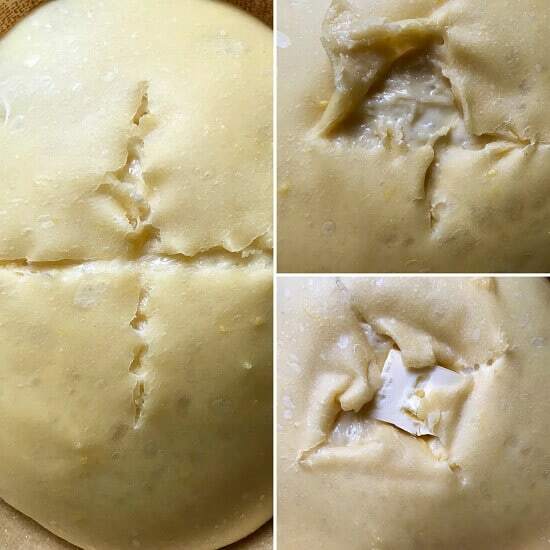 Place in a draft free place and allow the dough to rise to the top of the mold. There is no need to cover the dough. Please note that the dough can be placed in the refrigerator for an overnight stay. In the morning, take them out of the fridge and allow them to return to room temperature before proceeding. Once the panetonne are ready. you will notice that a crust has formed. With a very sharp knife, cut through the top thin layer and carefully peel back the top. Place about 1 teaspoon of butter in the center. Zia Michelinas Panettone are now ready to be baked. The panettone will take about 35 minutes to bake. You will notice that the top will get very dark. If getting too dark, you can always cover with a piece of aluminum foil. Once you have removed the panettone from the oven, pierce a wooden skewer through the bottom part and place it upside down in a large pot. This will help create a light and fluffy texture. My husband’s sister married a man named Agostino years before my husband and I ever met. Agostino’s mother is Michelina. We would respectfully refer to her as Zia Michelina. My niece, Agostino’s daughter, Zia Michelina’s granddaughter, kept and treasured her father’s recipe book long after he and her grandmother passed away. She tells me she found Zia Michelina’s Panettone recipe one day immediately after her passing – a recipe she thought had never been transcribed, and so a recipe she assumed was forever lost. My niece has supported my blog ever since its conception, and I’m so grateful to her for that. But recently, she put the icing on the cake: she arranged to meet my daughter, unbeknownst to me, to pass off her old recipe book. I was so surprised when my daughter came home with Agostino’s and Zia Michelina’s recipes! The recipe for Zia Michelina’s Panettone was the first I tried. It was clear how much she and my niece treasured the recipe, based on how neatly it was written, and how carefully it was kept. Like most Italian nonnas, Zia Michelina was a fantastic cook and baker. I had the privilege every year as she would help my sister-in-law host New Year’s Day Lunch. So, once again, a big thank you to my niece for having given me such a wonderful surprise. This recipe will forever have a special place on the She Loves Biscotti blog. I hope that you try Zia Michelinas Panettone recipe and share it with your family, so that her legacy can live on. For my dear family, friends and all of you that are celebrating Christmas, I would like to wish you and your loved ones a very Merry Christmas. And for those not celebrating Christmas, I hope that your day is full of love, happiness and wonderful moments with the ones that you love! 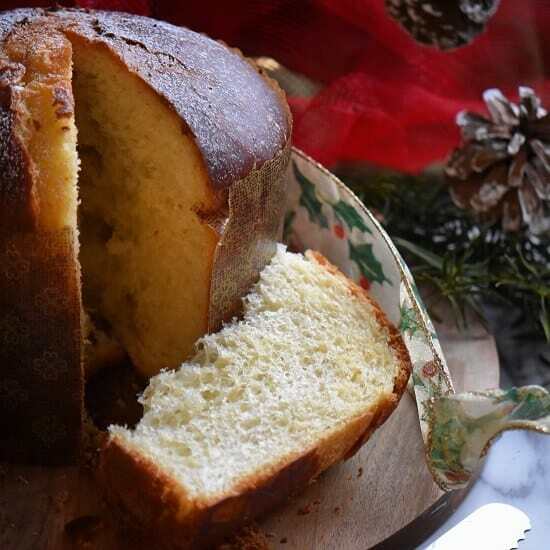 Zia Michelina's panettone is a family recipe for a traditional, rustic, Italian Christmas bread. So light and airy and so much healthier than any store-bought version. Meanwhile, in the bowl of a stand mixer, beat the eggs until light and frothy. Continue beating while adding sugar, oil, milk, vanilla, zest and finally the yeast mixture. Gradually add flour and knead for approximately 8-10 minutes until you have a soft, smooth elastic dough. 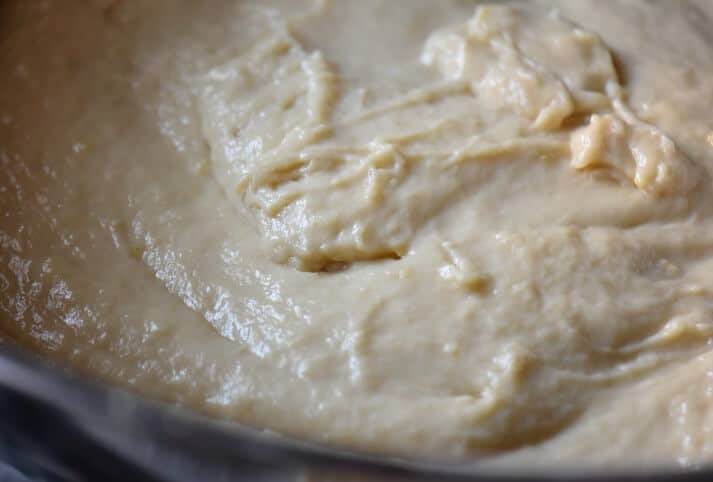 Gather dough in a ball and place dough in a very large bowl, cover with wrap and dishcloth and allow dough to rest for at least 2 hours (or until double or almost triple in size) in a draft free place. Separate dough in thirds and place in panettone molds. Allow to rest for another 2 hours or until dough has reached the top of the mold. With a very sharp knife, score slightly across top (make an X). Peel back the sections. Place 1 teaspoon butter in the center of the cut. Bake in a preheated oven at 350° F for approximately 35 minutes or until golden brown (set oven rack one below the center). 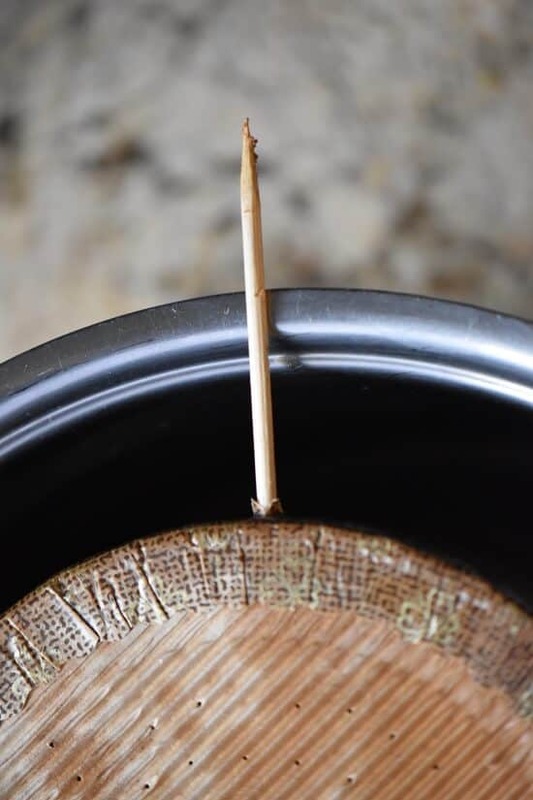 Once you have removed the panettone from the oven, pierce a wooden skewer through the bottom part and place it upside down in a large pot until completely cooled down. Special equipment required: panettone pans or molds (6 x 4.5 inches). If desired, you can add dried and/or candied fruit, chocolate chips, etc... after the first rising. Please note that the dough can be placed in the refrigerator for an overnight stay for the second rising. In the morning, take them out of the fridge and allow them to return to room temperature before proceeding. LOVE THIS POST? 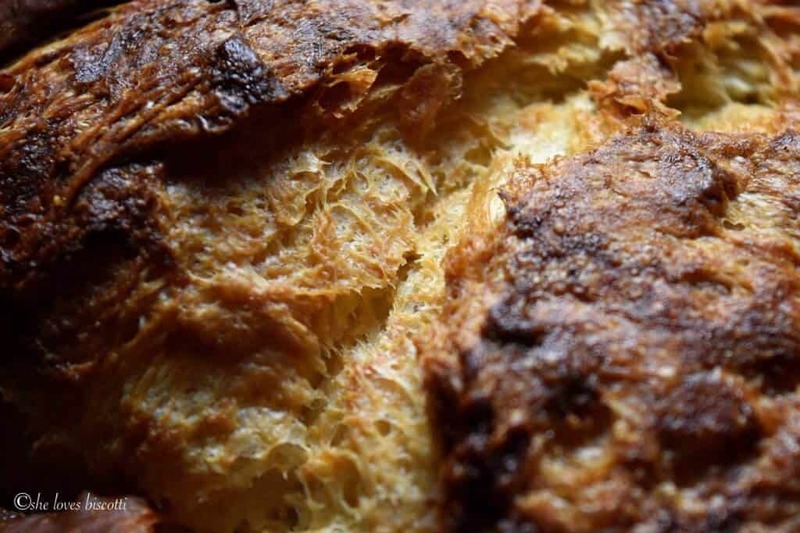 PIN IT TO YOUR SWEET BREAD BOARD! My sister Liliana of My Cookbook Addiction told me about this recipe. I’ve made two batches so far, fantastic results. Easy to make and delicious. 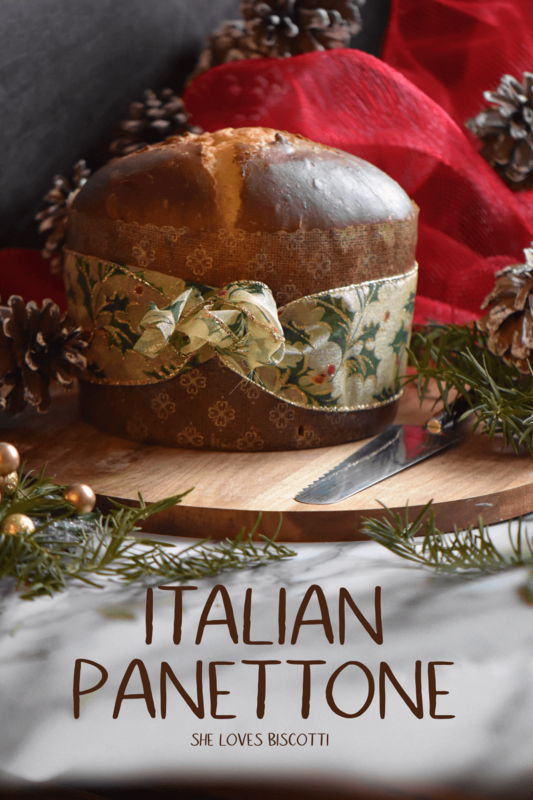 this is now my go to Pannetone recipe for the holidays. Just love it! Thank you. All the best. Hi I wanted to make panettone but don’t have panettone paper could I use parchment paper ? Reading through this recipe reminded me of the panettone my mother-in-law used to make. So I made it and the taste is almost the same. I made the three loaves and we’re on our second one. I will be making these panettone for Christmas and adding sliced almonds and orange rind as well. Thank you for sharing your recipe and bringing back a lovely memory. Merry Christmas! My goodness! So moved to have read your letter telling us all about this recipe. Seems like the stuff ccoking dreams are made off! Thankyou so much for sharing. Looks amazing can I add raisins and dried lemon or orange rind? 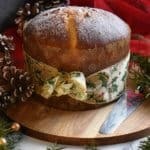 Hi Maria, I made this panettone this past weekend and it worked out beautifully and it’s delicious! My only disappointment was how stale it became after only one day. I had it covered in plastic wrap, but was still stale. Do you have any suggestions for next time I make it? I agree Lina. Once opened, it does become dry very quickly. That is why I like to make a few smaller ones rather than one big one. As a suggestion, the panettone does freeze very well and is easy to slice, even frozen. This is a relatively “light” panettone with no butter except for the small amount when it is being baked, so unfortunately that is the trade-off. Great comment, thanks Lina! Next year I am definitely making this amazing Panettone, adding maybe chocolate chips 😉 . It looks so light and airy, and tall, and just like the store bought, if not better! Another great recipe! Buon Natale to you and your family!! Made the panettone recipe was curious to see how it would come out. This recipe will replace my mom recipe got so many compliments on how light and airy it was. Thank you! Made this recipe, and wow. My Italian Campobasso Family was so impressed on how high and light the panettone came out. Just replaced the Vanilla extract with lemon extract now my mom is saying we can use Limoncello, so we will be trying that out on Saturday. This will be the recipe I will be using from now on. Thank you! what a wonderful blog, I don’t know how I came across it but I’m so glad I did. I love to cook and bake but don’t consider myself an expert, it doesn’t stop me from trying new recipes. your’s are so authentic, down to earth and very well explained. I was in search of a panettone the way my late aunt used to make and you nailed it. I tried it today, the only thing is that I’d add a few more tablespoons of sugar. usually I reduce the sugar contents indicated in a recipe, so this is great. I will be trying more recipes from your blog, its a keeper. thanks so much! 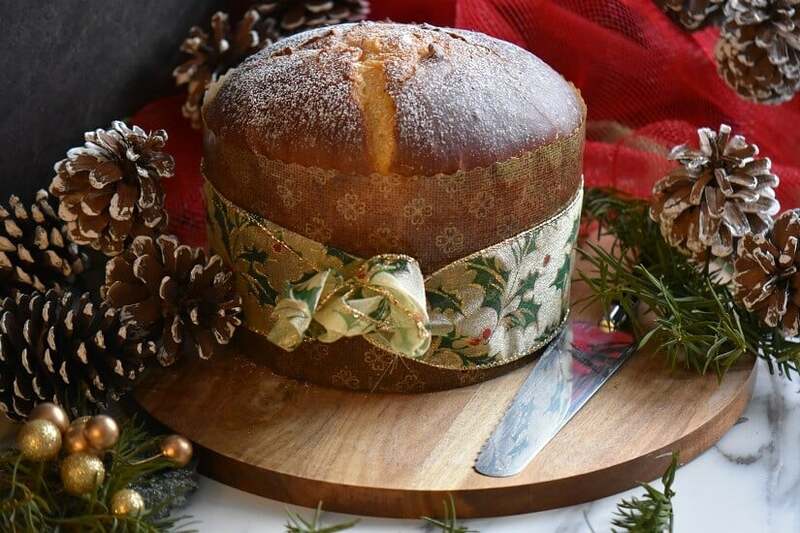 I definitely will have Mary try to prepare this panettone……it looks great!